If you are off-campus, connect to VPN, and then use the link above to register. Meets: TTH 8 a.m. – 1 p.m. The studio considers traditional urban challenges such as unem­ployment, poverty and inequity in light of new urban infrastructural technologies that are quickly becoming prevalent in an increasingly digital age. These new technologies are creating novel opportunities that pertain to small-scale entrepreneurship; the sharing economy; the Internet of Things (IoT); the Internet of People (IoP); new transport options (including driverless cars); the bottom-up leveraging of local and micro-situations; and new logistical options that can be used to enact a more circular economy. Meets: WF 1:10 – 5:20 p.m. This course is organized around the question: How can we best leverage our skills as designers and artists to create a better future? To answer this question, students will develop exemplary projects that challenge assumptions, push the boundaries of design practice, tackle complex problems with effective solutions and leverage their resources and skills for the greatest impact. Meets: MWF 1:10 – 5:20 p.m. The studio will focus on residential and healthcare facilities for maximizing our aging population’s wellness. With human-centered design approach, students will participate in various wellness design projects considering social awareness with an emphasis on older adults’ needs and requirements in their physical environment. Projects will include researching functional, psychological and social losses which older adults experience in later life and the role of the physical environment to support these changes. Students will participate in a short field trip to Ames and Minneapolis and also visit The Village in Florida, the largest senior living community in the world. The studio will ask multidisciplinary teams of students to design an urban hotel for one of two actual sites in Europe: either (A) in Paris, along the Seine, adjacent to the Eiffel Tower, or (B) in London, adjacent to the Millennium Bridge on the St. Paul’s cathedral side. Both sites will be visited on an optional field trip in January, coinciding with the Maison et Objet exposition in Paris that showcases hospitality design furnishings and materials, and meeting with representatives from Marriott International who are providing the site information. We will also visit several prominent architectural and interior design firms in both France and England and examine the larger urban context of each site in depth. Projects are expected to be well-considered for their highly complex urban site conditions, respectful of context, and responsibly designed with regard to both sustainability and accessibility, redefining luxury for a modern millennial customer. Students will have a rare opportunity to work in small, diverse teams on a high-profile project involving the Chief Justice of the State of Iowa for the Judicial Branch Building in Des Moines. Each team will develop a design proposal for an experiential learning space within the Judicial Building. The strongest proposal will lead to the development of the project that will be built. Funding has been provided as prize money for the strongest proposal and travel scholarships for the entire class. A field trip to Denver, Colorado, to visit similar facilities and cultural sites, as well as site visits to the Iowa Judicial Building and Capital Complex in Des Moines will be part of the schedule. Meets: MW 1:10 – 4:30 p.m. This is an interdisciplinary studio for civically-minded artists, designers interested in effective community engagement strategies and others wanting to apply creativity to working with communities. This course will explore strategies and methods for using art and design to increase social capital in communities. The Fabricating Potentials studio arc pursues a view of technology that includes not only the “how” (skills and techniques) of computational design but also the “why” (processes and impacts). This studio examines the relationships between technical advances in computational design (bits) and the consequences of these advancements upon the built environment (atoms). To this end, we will explore the intersection of computation, textiles and construction. 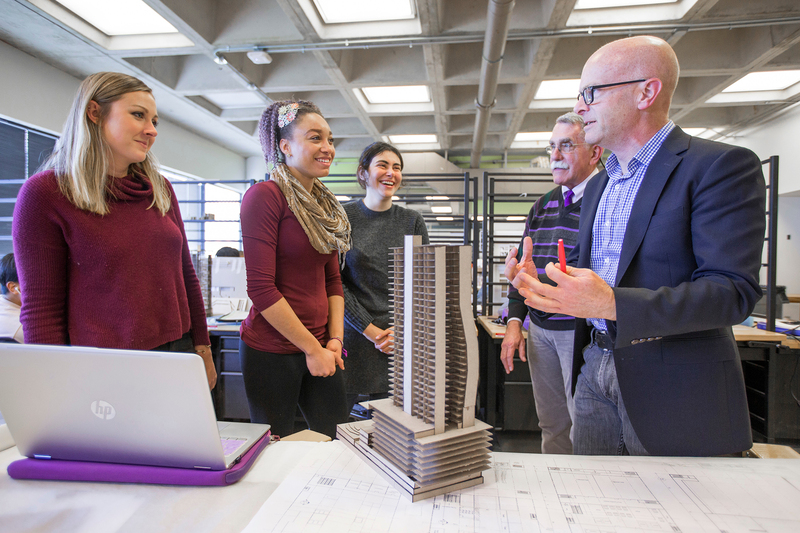 Students will leverage the tools of the ISU Computation & Construction Lab to fabricate textile structures for flexible concrete and plaster casting. In collaboration with the U.S. Department of State, this interdisciplinary studio will travel to Tangier, Mo­rocco, to measure and create 3D LIDAR scans of the exterior, gardens and interior public spaces of the American Legation, the first property abroad acquired by the United States gov­ernment for a diplomatic mission. The 18th-century building is listed on the U.S. National Register of Historic Places, is a National Historic Landmark and is the first and only such designation in a foreign country. Students will be trained in national and international preser­vation processes and will learn state-of-the-art technologies to survey, document and analyze elements of the historic prop­erty, and to disseminate information about it. They will an­alyze the property’s chronological development, architectural and interior character, physical condition and contemporary requirements through on-site analysis, interviews, videography, photography, LIDAR scans, archival analysis and other means. Students will devise, photograph, edit and sequence a photo-based project that will be made into a print-on-demand photobook by the end of the semester. Students will also have the option to make a photobook by hand instead of having it printed. Through discussions and critiques we will address idea development, visual communication, editing, sequencing, design and structure. Tutorials will be assigned or demonstrations given for skill development such as camera use, editing and printing, but basic skills in photography, creative project development, visual communication or computers will be useful. Along the way, we will have critiques addressing the technical, formal and conceptual progress of each project. In addition, there will be at least one guest and one visit to Parks Library special collections. Meets: TTH 1:10 – 4:30 p.m. This course will have two major areas of focus; drafting a business plan including; mission statement, business structure, target audience, market analysis, market strategy, and financing. These topics will be addressed through participative course presentations, visiting lecturers, and studio exercises. Students will design a product that fits their business plan and addresses both the environmental and social issues of its production. They will need to test the viability of the products marketability and production feasibility. There will be at least two field trips visiting maker spaces, shared studios and small-scale manufacturers. One trip to Des Moines and one to Minneapolis. Studio projects focus on the act of making and curating an iterative series of ephemeral installations within a dormant seed-drying chamber using ethno-specific logic as spatial conditioner. This course of study provides students the opportunity to make full-scale inquiries and, thereby, move beyond representational methodologies and precedents as the only means of cultivating design thinking. On a deeper level, however, we want to gain exposure to the intimate scale of the family farm unit with respect to the enormity of its host (agri)culture. We will employ at grade knowledge as both an investigative and a navigational strategy and reconcile the often-considerable gap between the representation of ideas and the construction of experiential space. Students will build on the work of last spring’s option studio to help the Acoma Nation in New Mexico envision a future education and learning “campus”/ “neighborhood”/ “complex”/ environment. The work you produce will help them continue to make choices about their future planning and development and their constructed place — buildings and landscapes — as well as their experience at the interior level. Your work may also be used as the Acoma Pueblo works to raise funding to make this project a reality. Students will be required to produce both presentation materials and project documentation for the Acoma Nation. Students who choose this option must be willing to be flexible and also respectful of different cultures, value systems and worldviews. This advanced interdisciplinary studio invites students to expand the development of conceptual, technical, and creative methods that they’ve acquired in the broad spectrum of design programs in the College, and apply them to toy design at various scales, categories and environments. The challenge will be to critically examine the creative processes used in the design of toys and play that engender greater meaning in our everyday lives and embolden us to have significant and creative impact in the world. Participating students will individually design and fabricate toys to a finished quality suitable for museum exhibition. In this collaborative and forward-thinking regenerative-design studio, we will tackle issues and challenges specifically related to one of the United States’ largest estuaries, the Chesapeake Bay. We will discuss global and local issues to better understand complex factors related to watersheds and watershed management; fresh, brackish, and salt-water ecosystems; long-term planning and politics of place; reimagined landscapes and deep ecology; and diverse populations and cultures within the Chesapeake Bay Region. We will explore new technologies, creativity, and participatory design solutions which challenge the status quo. And we will create educational, artful, innovative, and regenerative design solutions as part of our collaboration with the Chesapeake Bay Foundation (CBF) and with the ARCH 436-advanced digital media class. How might we better design the world around us for future generations? How might we plan and design with rising sea-levels in mind? How might we make a difference? How might we do more than simple “do no harm?” How might we “do good” and give back more than we ever thought possible?